We started the "hard" hyperbaric treatments yesterday. By "hard", they are in a hard chamber instead of the soft, bag chamber we've done the previous 41 treatments in. The biggest difference is the fact that 100% oxygen is used at even more pressure. If you'd like to read more about the center we are going to, you can visit http://hboinfo.com/ncarolina.htm. There is a lot of info there and they do a better job of explaining it than I can. We've decided that we're going to do Aidan's treatments at the center instead of trying to purchase a soft, "mild" hyperbaric chamber. The benefit to him is much greater. 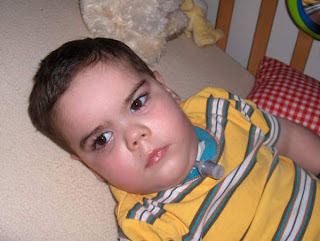 This week Aidan will do 5 treatments and then we'll have to schedule the rest. The plan is to do 40 treatments and then take 3-4 weeks off. Hopefully in that time his stander will arrive and we'll be able to get him upright and bearing weight in his legs again. Aidan seems to have done okay with the treatments yesterday and today, although he had a rough night last night. I'm not sure what the problem was. Today while he was in the chamber with Russell he rolled from his back to his side. Russell wasn't sure if Aidan did it on his own or if he did something to "help" roll him. I've noticed that he seems more alert when he's awake, but by about 8:30 he is ready to go to bed. He was so sleepy this evening. I forgot to mention that on Monday night I put Aidan on his tummy on a wedge and he did great. He usually cries when you first move him to his tummy but then settles down and will fall asleep once he's comfortable. This time he didn't fuss at all and he even tried to turn his head on his own. I ended up helping him a little, but he got halfway there without any help. I've bought a hammock swing on ebay and will be getting a stand to use with it so that we can swing Aidan. I have the foam needed to make him a raised therapy mat/table, and just need a frame built. This is the type of table I'm wanting to have made. I know some people have asked me what I'm talking about when I mention a therapy table. Thank you everyone for your continued prayers, and we'd like to thank everyone who has donated or bought a wristband to help us with expenses related to caring for Aidan. We don't know a lot of you, but we consider you all friends and we keep you all in our prayers as well. I pray that I continue to have good news and progress to update you all with as we go through all of this. Aidan is going to surprise us all, I just know it. Erin, wonderful news about the hard chamber. That photo of him is striking - I say it every time, but I cannot get over his eyes. I love to hear he moved his head and maybe even rolled to his side. I pray that he has a restful night tonight and that you & Russell do as well. Praying literally every day. We just use our coffee table with a therapy mat tied on and we kneel around it to do the therapy. Just a thought while you wait for a table to be made. At the beginning we used the foam layed on the dining table. Aidan is looking very good and healthy. You guys are doing a great job. I was wondering how the job hunt is going? I did get a job ... thank goodness! It is just a two-month contract, but at least it's something. I don't mean to be pushy, but I need my Aidan update!